There are no ties in Baseball anymore. Now you might say, “were there ever ties in baseball?” Or, “there haven’t been ties in Baseball for 100 years, since they started playing extra innings.” That’s true, except there were still ties in Baseball until just a couple of years ago. Through the 2006 season, if a game was rained out after 5 innings with the score tied, it counted as a complete game. It was a tie, even though MLB didn’t keep track of the ties in either team’s win/loss record. All of the stats from the game counted as official stats. Then the entire game was replayed at a later date. Then they changed the rule. Now rained-out games that are tied after 5 innings are suspended and continued from where they left off at a later date. Had last night’s World Series game happened a couple years ago, the Rays and the Phillies would be playing an entire new game tonight. Although, the tragedy for both teams is that had they scored just one more run (or in the Phillies case, had they just kept Tampa from scoring in the 6th) and been winning when the game was called, they would have won. The Rays would have stolen a win and gone back to Tampa still alive. 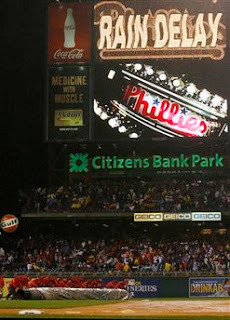 Or perhaps more bizarrely, the Phillies could have won the Series on a rain-shortened game. Typically one of the most memorable moments of a World Series is when the last out is recorded or the last run scores to win the game and all the players pile on top of each other in celebration on the field. Had the Phillies won on a rain-out, that moment would have been an umpire walking on the field making a series of hand gestures to indicate the game was called and the Phillies had won the game and the World Series. Would the players have piled out on the field in the rain anyway, or would that moment have been just too anti-climactic? We’ll never know. There are no ties in Baseball anymore, and now no rain-shortened post-season games either.